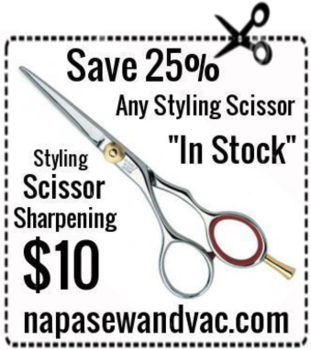 Napa Sew & Vac boast the best scissor collection in Northern California. We inventory a sampling of Fabric, Fabric, Leather, Barber, Styling and Grooming scissors. We supply scissors at competitive pricing with quantity discounts. 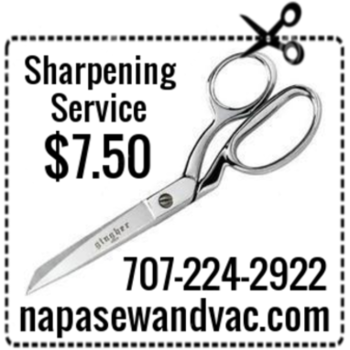 Napa Sew & Vac is a full service scissor supplier complete with sharpening services. Choose from a variety of brands: Gingher, Wiss, Mundial, Fiskar, Horn, Tooltron, Ergonomix, Wolff, OOKAMI, Kai, Mundial, Hira-To and other leading brands. 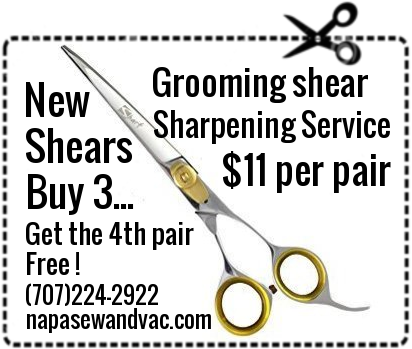 We use the finest scissor sharpening methods and can recondition the edge on most scissors @ $7.50 per pair. 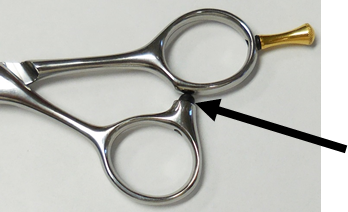 Hair Styling Scissor are sharpened with an 800 grit diamond wheel @ $10 per pair. 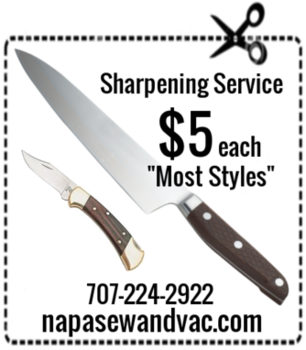 We also sharpen knives @ $5.00 per blade. We return serrated scissors and blades to the manufacturer for reconditioning. We can replace the bumpers! The Tapered Shaft Bumper is the most used repair part in the sharpener’s “tool box”. The size (S, M, L) refers to the height and diameter of the bumper head. The tapered shaft is designed to fit into the greater majority of bumper holes whether tapped for threaded bumpers or smooth for “pull through” bumpers. Because of the tapered shaft, glue isn’t typically necessary when installing these bumpers. However, for added security I have trimmed the excess shaft slightly long inside the grip then melted the remainder to form a flattened “head” like a blind rivet head. In the picture is a Small Tapered Shaft Bumper which has been installed into a very tall bumper stand on the thumb grip.